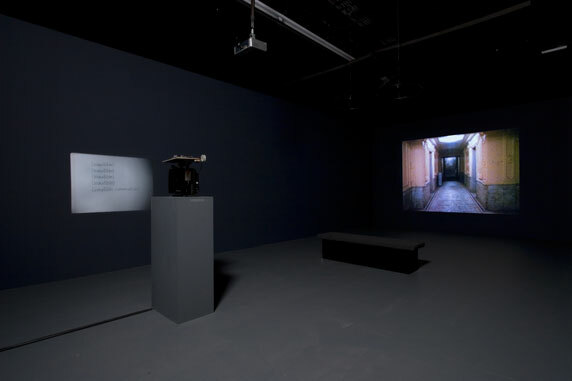 The two film and video works presented in this exhibition entitled Transcript (2006) and Inaudible (2006) evolved from Jenny Perlin's research into now-public FBI documents of secretly transcribed conversations from the Red Scare of the 1950s. Addressing the expansive net of espionage during the McCarthy era and the resulting paranoia about hidden enemies, Perlin’s work underscored parallels to anxieties surrounding privacy and surveillance in America at the time and continues to offer insight to our current milieu. The videos are part of an ongoing body of work called The Perlin Paper project, a multi-part project that takes its title from the name of an archive at Columbia University Law School. This archive contains 250,000 documents related to the case of Julius and Ethel Rosenberg. For two decades after their execution, the FBI spied on hundreds of people tangentially connected to the case. The archive is named for the artist’s relative, Marshall Perlin, a lawyer who forced the U.S. government to release the papers in the early 1970s. This exhibition was curated by Matthew Lyons.